Churchgate Terminus (now the Western Railway Headquarters), Bombay (Mumbai). Designed by Frederick William Stevens (1847-1900). 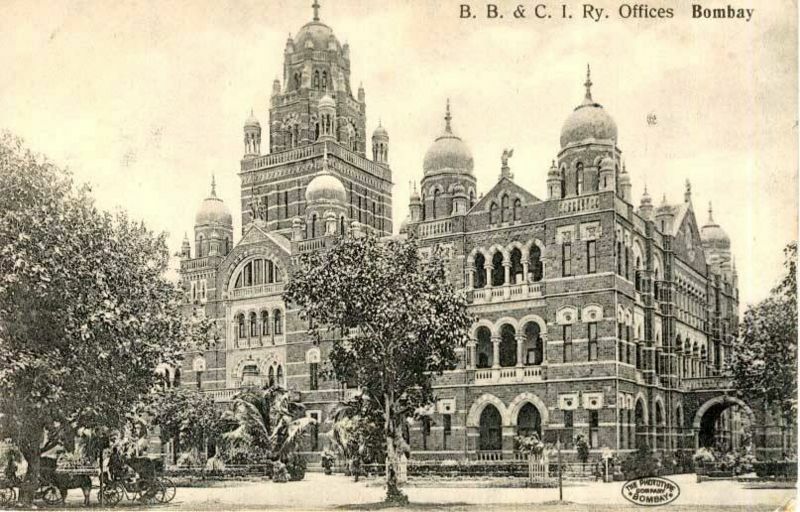 The company was granted the plot in the old Fort area of Bombay in 1889, and work began on the building of this suburban terminus of the Bombay Central and City line a few years later. 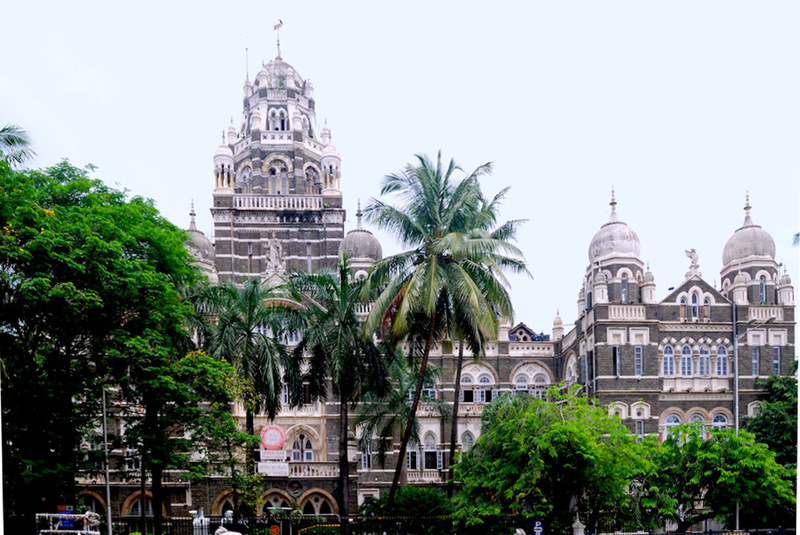 Similar in plan to the competing Victoria or Chhatrapati Shivaji Terminus, this was built more quickly. It was opened in 1899. It is faced with "rough-hewn ... blue basalt inlaid with bands of brilliant white counterpointed with red Bassein sandstone creating a Byzantine quality" (Davies 177-78). Although overshadowed by its great sandstone rival, this suburban terminus for the Western Railway is also a very substantial and even majestic building. It is known as WR HQ now because it is used only for the railway offices. The suburban network is served by a modern station using the old name. Left: The tall domed tower of the former Churchgate Terminus, rising up from its square base through balustraded, turreted, and domed octagonal stages to its own neat dome. Note the sculptural group crowning the gable here. Right: A postcard of Churchgate Terminus in the early years. 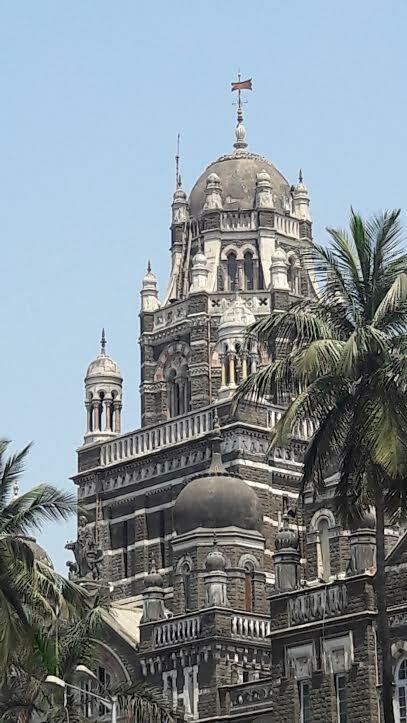 Each façade has a central gable with flanking pinnacled domes and a winged figure at the apex, while the main one, above the porte-cochère and below the tower, has a monumental group at the top, with a female figure representing Progress (as at the Victoria (Chhatrapati Shivaji) Terminus) or, as Mary Ann Steggles and Richard Barnes suggest, Engineering (237). The latter seems more probable because this figure holds a railway engine in one hand, instead of raising a flaming torch, and the two figures at her feet, like putti, seem to be associated with railway work, one with his hand on the wheel, the other intent on some other task. Philip Davies talks about the "vigour and originality" of Stevens's work (178), much in evidence in this blend of Venetian Gothic, Indo-Saracenic, and — just at the time of the revival of this style in England – Byzantine. It is interesting that his skills were supplied to the suburban terminus as well as to the more exuberantly embellished intercity one nearby. The hope was for the suburban railways to encourage productivity, enabling the movement of people into the industrial centres; people from the surrounding areas certainly did pour into the city, though Arindam Dutta points out that even by the time of independence "approximately 95 percent of labour was still employed in the non-industrial sector" (99). "Bombay, Baroda, and Central India Railway." Fibiwiki (an encyclopaedia about life in British India). Web. 2 July 2016. Dutta, Arindam. "'Strangers within the Gate': Public Works and Industrial Art Reform." In Colonial Modernities: Building, Dwelling and Architecture in British India and Ceylon. Ed. Peter Scriver and Vikramaditya Prakash. London: Routledge, 2007. 93-114. Dwivedi, Sharada, and Rahul Mehrotra. Anchoring a City Line: The History of the Western Suburban Railway and Its Headquarters in Bombay, 1899-1999. Mumbai: Eminence Designs, 2000. Michell, George. Southern India: A Guide to Monuments, Sites & Museums. New Delhi: Lotus Roli Books, 2013. Steggles, Mary Ann, and Richard Barnes. British Sculpture in India: New Views and Old Memories. London: Frontier Publishing, 2011.